I just returned home from Salt Lake City. "Oh, I loved the Winter Olympics," you say. "It must have been exciting to be in Utah!" Well, exciting might not be the best word. I enjoyed the experience, and it was profitable; but on the other hand, working on the television crew at Salt Lake was perhaps the least challenging job I've ever had. 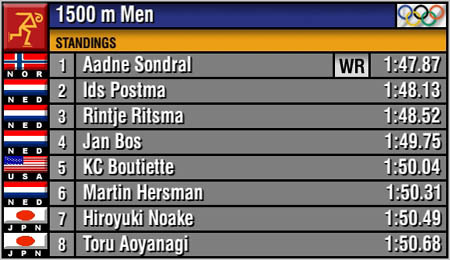 There were great inequities at the Olympic Games, and I'm not talking about the judging. I refer instead to the workers behind the scenes. Some who worked the hardest were paid the least, and vice versa. On one end of the scale: thousands of unpaid volunteers, mostly Utah residents who gave up their vacations to shovel snow or direct traffic. In my specialty, TV production, many of the workers were semi-interns. These college seniors had to pay their own way to Salt Lake City and find their own housing. They were expected to put in long hours, sometimes under trying conditions, and to perform at a professional level. They did receive wages, but at only half the rate I'm used to receiving. At the other end of the scale: yours truly. As a professional graphics operator, I had all my expenses taken care of, and I was paid nearly my usual rate. 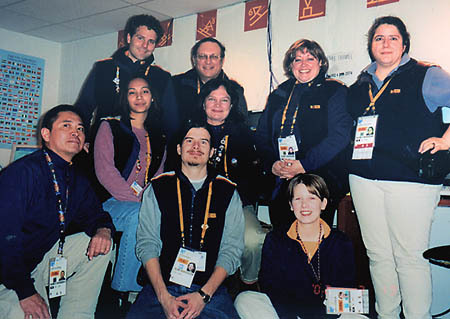 Usually I'm hired for only a few days per week; but at the Olympics, I was on duty for four straight weeks without a day off. On six occasions my day was more than 12 hours long, so I earned a significant amount of overtime. But my actual tasks for the whole month could have been performed in about three days. I worked at the IBC for ISB. Those abbreviations require a bit of explanation. 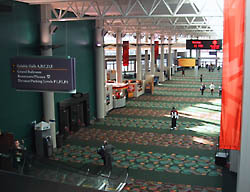 The IBC, the International Broadcast Center, shared space with the rest of the media in a convention center downtown that is otherwise known as the Salt Palace. My employer was ISB, International Sports Broadcasting, the host broadcaster responsible for providing television coverage of every event to the world. Our world-feed pictures went to rights-holders in each nation, who chose the events that they wanted to broadcast and added announcers' commentary and other elements. In this country, the rights-holder was NBC, along with its cable networks CNBC and MSNBC. That was probably how you watched the Olympics. In Canada, the rights-holder was CBC; in Great Britain, the BBC; and so on. 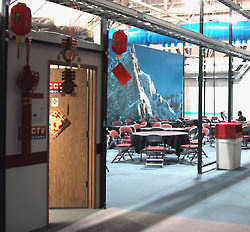 Most rights-holders had production offices and studios inside the IBC, where there were also snack bars and other facilities. This doorway, for instance, led to the facilities of CCTV, Chinese television. For the world feed, our graphics looked like the example below. We identified the competitors and showed their times and scores, using as few English words as possible. Symbols were important, such as the red-and-gold "pictogram" to identify the sport  in this example, speed skating  or the flags to identify the nations. We avoided information such as "Won gold medal in 1500 meters at Nagano, 1998," leaving that for the announcers to report in their own language. I stayed at the IBC for only two days at first, January 30 and 31. Then for the next week, I was no longer concerned with competitors or results, because I was assigned to the Opening Ceremony. That event was scheduled for February 8 at the University of Utah's football stadium, two miles east of downtown. Here the graphics would be limited to simple identifiers in the lower part of the TV screen. Our broadcast compound was set up in the parking lot below the west side of the stadium. I took this 180° panoramic view looking north. (Click the picture for a larger image). You don't see the NBC trucks, which are behind me. The stadium is at the right. The last gray trailer on the left, behind the last light pole, is the catering trailer where we ate lunch. Just to the right of the center of the picture are the two production trucks supplied by National Mobile Television. My truck, DX-5, has its tractor still attached. Further to the right, the next truck, HD-1, produced a similar telecast to ours except in high definition. Other mobile units arrived after this picture was taken, including one for German television and a little Japanese 3-D van. Yes, the Japanese broadcaster NHK used its experimental 3-D "Hi-Vision" format to record the ceremony. Later, I watched some of this tape back at the IBC. A pair of video projectors were aimed at a single screen. Nearby was a box of plastic polarized glasses. The image was dim to begin with, and the glasses cut the brightness in half, so the room had to be completely dark. If you looked at the screen without using the glasses, you would see double images. Donning the glasses sent the left image to the left eye and the right to the right. The alignment wasn't perfect, however. And the experimental setup used only two pairs of cameras, neither of which was able to zoom. The result was a fairly realistic stereoscopic picture, but one that owed more of its realism to being hi-def than to being 3-D.
One portion of the Opening Ceremony required graphics to identify the 77 participating nations as they entered the stadium with their respective flags. I had those prepared in a couple of hours. (Even one for President Bush. It was considerably easier than the Opening Ceremony for the summer Olympics in Atlanta in 1996, where I had to type in 197 nations as well as the names of their flag-bearers.) The rest of the week was spent in rehearsals of the various parts of the show, followed by full dress rehearsals. Another graphics operator, Tom Grow, was doing the same job as I except in hi-def. He pointed out that they could have brought us in a week later and we still would have been ready. But the fact that the work was easy didn't cause us to turn down the money. The Opening Ceremony was supposedly seen by four billion people around the world. (I think that it might have been available to four billion people, but only a fraction of them were actually watching their TV sets.) Two weeks later, I would return February 21 through 24 for the Closing Ceremony. In the meantime, between the ceremonies there were athletic events. During this time, I was sent back to the IBC and assigned to the "Backup Room." 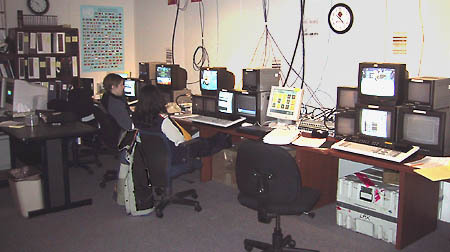 Here we had three Chyron graphics machines, each connected to the official timing and scoring computers. An in-house cable TV system allowed us to watch ISB coverage of any event as it took place. For example, each day at 9:00 AM and 2:00 PM and 7:00 PM we could choose from four channels of curling. That was more than enough. We could also watch some of the rights-holders' programs, such as NBC, CNBC, MSNBC, and the Australian Channel 7. It was odd to tune to Channel 7 on a Monday afternoon and see live pictures of Brisbane on the Tuesday-morning "Sunrise" show, along with information on the best prices for petrol in the Melbourne area. We practiced calling up graphics while the events unfolded on our screens, so that we would be ready in case we were called to substitute at one of the sites. I actually paid a Sunday-afternoon visit to the curling venue, an hour's drive away in Ogden, but it turned out that the regular operator did not need to be relieved after all. Alternatively, if one of the venues developed technical problems with their graphics, we in the Backup Room could call up the graphics and have them added to the venue's pictures through the IBC's giant Master Control facility, seen here. However, this never became necessary. During the time that I was on duty, we had three alerts. We started to get ready to provide the graphics, but in each case, the problem at the venue was solved long before we had to go on the air. Mostly, then, I just hung out in the Backup Room with the rest of the staff. Here's our official picture. Sue Sneed, and our manager Maria Persechino. Sitting in front of me are Jill Gorsh and Lou Moore. Kneeling: Sam Goodman, Keith Kramer, and Birgit Davidson. Sometimes I had minor tasks to do, such as copying disks to be sent out to the venues. But there was plenty of time for conversation and reading books. Early one evening, we had visitors to our room. A man who worked elsewhere for ISB stopped by with his wife and their precocious six-year-old daughter, who was wearing a shirt autographed by the Jamaican bobsled team. "Daddy says," the girl reported, "that you people watch TV all the time in here." We admitted that we did. She lamented, "My parents only let me watch an hour a day." "But tonight," interjected her mother, "we're on our way to the Medals Plaza to see the show in person. That'll be fun." We could not disagree. As they left, the girl called out, "So long, TV-watchers!" Want more? For my other article about my experiences in Salt Lake City, including the opening and closing ceremonies, click here.